On the last few days before Christmas, millions of shoppers will be praying for shorter queues at the check-out. A new payment card being issued to millions of people by the banks promises exactly that. The cards are contactless, enabling transactions in a matter of seconds. But retailers say prices in some shops may have to rise, to pay for the extra cost of the technology. So far the cards are being tried out by Tesco and Boots, as well as numerous smaller cafes. Pret a Manger and Café Nero have already decided to adopt the technology. 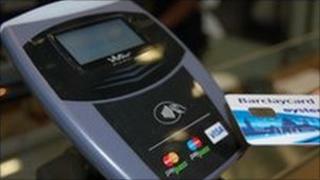 Contactless cards, as they are called, can only be used for transactions under £15. HSBC cards have a "pay pass" logo on them, and Barclaycard uses a wireless symbol. Customers normally have no need to enter a Pin code. Instead they swipe the card across a reader, enabling the transaction to be completed within a matter of seconds. To protect against security concerns, customers may have to enter a Pin on occasion, or if the card has been used a number of times in quick succession. If there is any fraudulent use of the cards, the banks have promised to make refunds without question. Concerns have been raised that as more people to use cards, instead of cash, the cost to retailers increases. The British Retail Consortium (BRC) estimates that accepting cash payments costs shops on average 2p per transaction, owing to the cost of someone having to take that money out of the till and pay it into an account. But when someone pays with a debit card, the bank charges the shop on average about 8p per transaction. With a credit card, that fee rises to around 33p. The BRC is therefore worried that some shops may have to increase prices to pay the extra charges. "Clearly they would either have to look at narrowed profit margins, or some form of passing on that cost," says Tom Ironside, of the BRC. Given that many shops will chose to absorb January's VAT increase, many will not want their profit margins to suffer. Roger Wilsher is one businessman who is not happy with the contactless card scheme. He runs a dog daycare service called CDPOM in Bermondsey, in south London, and is about to open a small retail outlet on the premises. As we join him, he is giving Hermes, a Wheaten Terrier, a work-out on the treadmill. Rather like the machine itself, he feels the banks are pressing ahead with contactless cards too fast, while businesses like his are not given the choice of slowing down or jumping off. "It is just something else we have to manage," he says. "It's likely to be more of a burden than a benefit." In fact Mr Wilsher has calculated that he'll have to increase his turnover slightly just to pay for the extra card costs. Barclaycard says the figures put out by the British Retail Consortium overestimate the actual charges that retailers would have to pay to the card providers. Because the total transaction cannot exceed £15, it says the amount that shops would have to pay would be much lower than 8p on a debit card, or 33p on a credit card. But could shop prices still go up? "I hope that will not be the case," says James McDonald, of Barclaycard. "I think the case for contactless cards is pretty compelling. Queue times are 20% less in a normal retailer, and 40% less in a big-queue environment." And the company denies putting pressure on retailers to accept the new technology. Indeed it is now being trialled in many other places apart from shops. Wembley Arena and some black London cabs are testing it, both for security, and to work out whether it is worth their while. By 2012, when the Olympics are held, it is thought that tens of thousands of shops and venues will accept contactless payments. By the end of this year, Barclaycard estimates there will be 12 million cards in circulation in Britain. So while some questions remain about the cards, it looks like the technology will have unstoppable momentum.